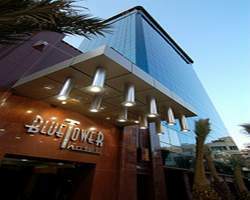 The blue tower hotel offers all the services of a four-star international hotel; Presidential suite, bathrooms are provided with Jacuzzi, comfortable rooms equipped with the modern technology services; communication facilities within each room fax, telephone, high speed internet, flat screens, unique designed interior The Blue tower Hotel offers among its facilities: An international restaurant, café. Whether it’s a small family gathering or a business affair, out hotel is definitely your only destination. An international restaurant. Located on the Mezzanine floor, and presents the best of Syrian and international dishes as well, prepared by our Executive Chief. Blue Tower Hotel services include all business man needs: telephone, fax, photocopy, e-mail, high speed internet, meeting room, computer. etc.